Round 1 of my ImagineIT project began on November 2nd. It is hard to imagine that four months ago I began the fellowship journey. With any journey, stopping and reflecting allows you make sure you are on the right path and see if adjustments need to be made. For my ImagineIT project, the key idea I wanted to focus on was the big picture of mathematics through student understandings and misconceptions. I used the Standards of Mathematical Practices 1, 3 and 4 to organize my mission. Standards of Mathematical Practices 1: Make sense of problems and persevere in solving them. The first activity that I implemented was called "My Favorite Mistake." At the end of each week, students celebrate a mistake they made by sharing their misconception and then what they learned from it. As of right now, the students are only sharing it with me. For an extension, I would like the student to share with others and also choose a mistake from another subject area. When we first began, students were reluctant about admitting they made a mistake and several could not understand why you would want to celebrate it. Some students were also sharing more general mistakes like not doing their homework, not paying attention or missing school. The second week of implementation I made sure to emphasize that we were sharing a mathematical misconception. Since then, students have shared a specific math problem. Originally, I had wanted to do this every week but with the numerous days off in November it became an activity for every other week. I also implemented the "It's a Mistake Music." I took part of the Chorus from "It's a Mistake" by Men at Work and whenever someone makes a mistake we play the music and dance. I created a little video for it and wanted to play on my Promethean Board, but unfortunately YouTube is blocked in CPS and I would have to type in my credentials each time. As a work around, I downloaded the music to my desktop so it is easy to find. I introduced it by having the students listen to it and told them to come up with a dance move. Of course, I participated and gave them some ideas. I was surprised by how many students did not know the shopping cart dance move. They laughed and enjoyed it but I think a few still confused by why we would do it. Students are quick to find mistakes and ask for the music to be played. I have also noticed that students that did not participate before are more likely to participate now. The music is also a good reflection for me to gage whether the lesson was high quality. If we did not play the song for the day I realized that it was for one of two reasons. Either I did not let the students share out enough during the class or the material did not challenge them. In addition to this, there is a growth mindset board in the room to remind students the importance of it. The students have math journals where they reflect on the unit and ask questions. I created a template using Google Docs and posted it in Google Classroom so each student received their own copy. On a day when we will reflect, I move the math journal assignment to the top of Google Classroom so it is easy to find. One thing that I still want to do is create a playlist of songs that talk about mistakes. Over Thanksgiving Break, I am going to tell the students that they have a mission to find as many songs as possible and share the titles with me. I can then create the playlist that the class can listen to while we celebrate our favorite mistakes. Standards of Mathematical Practice 3: Construct viable arguments and critique the reasoning of others. Of the three Standards of Mathematical Practice, this one is the least implemented. I had the senior students complete a "Gallery Walk" where each group displays their work on a large post-it then groups move from one masterpiece to the next critiquing the work. The first time we completed the activity the responses were somewhat general. The next time I gave examples of the caliber of responses I expected and students stepped up to the challenge. Critiquing the work was also a great reminder for growth mindset and being open-minded with others opinions. After Thanksgiving Break, the junior class will start arithmetic and geometric sequences and series. I worked with Leslie Lynn from Argument Centered Education (ACE) to create an introduction for deductive and inductive reasoning. For my senior class, I will implement the "Is It Justified?" activity from last year where students argued which justification was correct. Standards of Mathematical Practice 4: Model with mathematics. I have implemented more real world mathematics in my classroom this year than any other year. For the junior students, we studied scientific notation and I introduced the concept with pictures of the hydrothermal worm and the parvovirus. For conversions, students "travelled" to another country, found a hotel, food and entertainment and had to convert their currency. Students worked in pairs, created a Google Slides presentation and then recorded a Screencastify describing their trip. Recently, I introduced the first 3 ACT Math activity where students demonstrate their understanding of systems of linear equations by stacking cups. The activity was created by Andrew Stadel. The students were interested in the video and asking questions. The first day we watched the video, the students received the supplies and worked in their groups to determine when the cups were the same heights. Each group was trying different methods. Some created a table while some were using logic. The next day students received the "Stacking Cups Exploration" activity sheet to help them formulate their responses. Many groups could figure the answer using one method but had difficulty demonstrating their findings using multiple methods. For the senior students, when we studied average rate of change we used real world examples of graphs, tables and functions. The culminating project had the students researching data on their Chromebooks and creating, solving and explaining their own average rate of change problems. Students were able to choose data that they were interested in and led to peer-to-peer discussion about how to organize and clearly articulate their understandings. This year when I introduced limits I found "An Intuitive Introduction to Limits" by Kalid Azad. He gives the example of watching a soccer game where the connection is choppy. 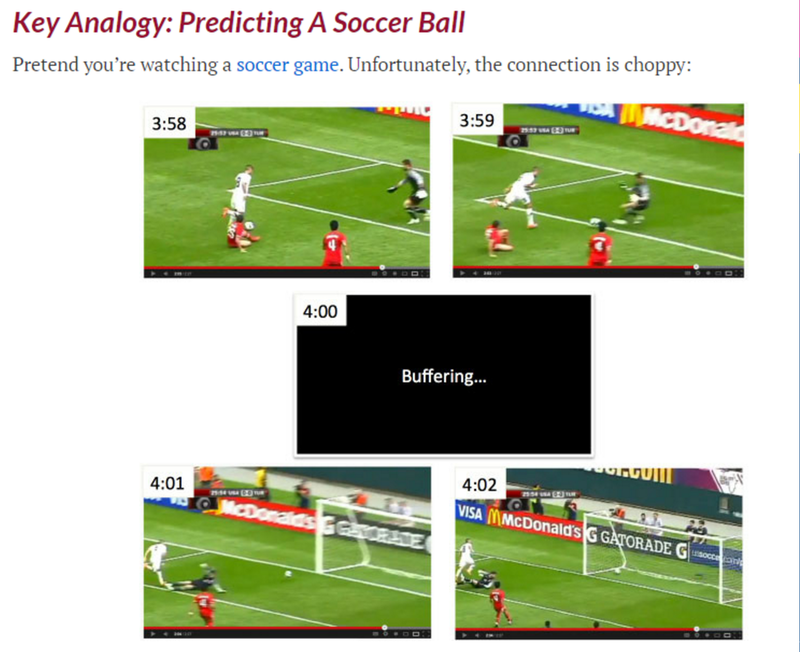 The students had to predict what happened in the frame that was buffering. Students argued about where the ball would be and whether the goalie was on the ground or not. The reason why it sparked an interest in the students was because they could relate to the example and the question did not seem related to math. This relates back to the 3 ACT Math idea, take the "math" out of the problem. We also talked about what time was best to make an accurate prediction. Students agreed that the closer you were to the missing the frame the better the prediction. The idea of predicting where the ball is a concept that we continue to revisit. By making the connection to the real world, students gain a deeper understanding. After reading What should I do? Confronting Dilemmas of Teaching in Urban Schools, I learned that there was a difference between dilemmas and problems. Problems can be solved “by following procedures and routines built into the classrooms and school systems” (Richert, 2012, pg. 6). While dilemmas do not have an easy answer, “they pit two or more values or goals against one another” (pg. 6). One can easily become overwhelmed by problems when the focus should be on dilemmas. By predicting dilemmas, teachers can create possible solutions and will be more prepared for what may arise. My key takeaway is to plan for dilemmas when implementing new lessons. The focus group taught me that teachers do not always ask students how they feel about their education, what matters to them or solutions to dilemmas. The student responses demonstrated the maturity of students when they feel comfortable to express themselves and that their opinion matters. Their responses strengthened my resolve that I was on the right path with my ImagineIT project. Besides gathering insight from my students, I also discussed the ImagineIT dilemmas with my colleagues. One suggestion was to have students create recordings of their performance tasks instead of students creating Khan Academy type videos. I have implemented this with my Advanced Algebra class to enhance their understanding and improve communication skills. I still want to do this with my other class. Another teacher suggested giving more examples of My Favorite Mistake to highlight exemplars. Missy made the insight that maybe students would not feel comfortable sharing their work. I asked two students and they did not want to share. I decided to create examples based on possible misconceptions and have the students critique them. Once again this shows the importance of reflection, I had started but not implemented this critique activity and forgot about the insight with the bustle of the school day. Since writing the implementation report, the biggest insight that I am struggling with is if a mistake and a misconception are the same thing. Should I be using misconception instead of mistake? They are synonyms of each other. A misconception is defined as a wrong idea or impression while a mistake is defined as an error or misunderstanding according to www.dictionary.com. Am I confusing the students by talking about mistakes and misconceptions? Should I just focus on one term? I always thought that a mistake is the result of a misconception. Is this always true? What about the mistake that results from rushed thinking or misreading? I need to clarify this insight to see if changes need to be made to the misconceptions part of my ImagineIT project. Besides focusing on the connection between mistakes and misconceptions, moving forward with round 2 of implementation will include critiquing examples of My Favorite Mistake, introducing Screencastify to the senior class and continuing work on the Standards of Mathematical Practices 1, 3 and 4. I need more time with focusing on the big picture of mathematical understanding through the analysis of misconceptions in order to further develop a deeper insight.